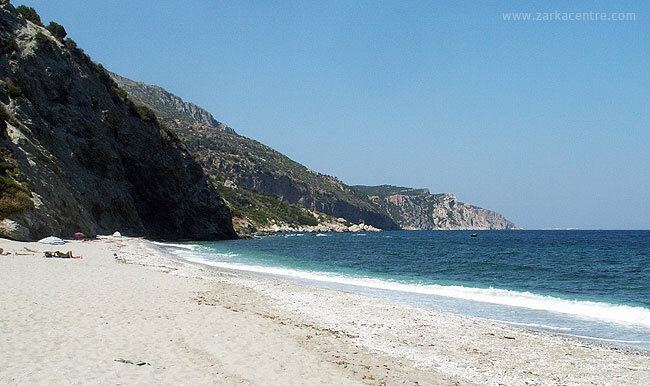 Zarakon Beach, the nearest beach, is some 4 kilometers (40 minute walk - 15 minute drive) along a road to the north (Aegean) coast. This coast is spectacular in its ruggedness with mountain slopes sliced and sculpted by the sea. There are some truly fantastic walks through wild marquis landscape punctuated by sheltered coves and bays with sand and pebble beaches. These beaches are less frequented than those on the south coast and offer good snorkeling – but you need transport. Some beaches have tavernas serving simple but delicious food. On the south side of the island the hills slope more gently down to the long, flat sandy beaches (the nearest about 15 minutes drive). This side of the island attracts more tourists in the summer, but Evia is remarkably undeveloped compared to the well known Greek islands. The nearest market town is Aliveri, 30 minutes drive to the north-west. This has a range of shops, banks, bars and cafes, and a harbour with several tavernas. 40 kilomentres to the north-east is Kimi, a charming hill town with a pleasant harbour below, where the ferry to Skyros is located. 20 minutes drive south of Zarka is the delightful seaside village of Nea Styra, where the ferry from the mainland arrives. Nea Styra has a charming beach, several hotels, some small supermarkets, cash point, a range of tavernas and restaurants and a play area and outdoor cinema for children. Further south, towards the southern end of the island, is the attractive coastal town of Karistos, overlooked by a large Lombardian fortress and by Mount Ochi (1404 metres). 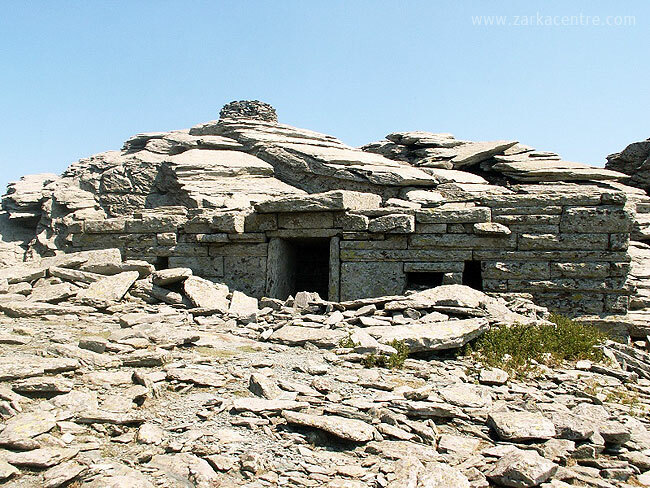 At the top of Ochi is the best preserved of the 12 Dragon houses of South Evia – the mysterious and impressive prehistoric buildings – other fine examples are found near Nea Styra. Running from the far slope of Ochi to the Aegean sea is a spectacular gorge (one of several on Evia). Here, an ancient stone paved track runs alongside a tumbling stream amid beautiful surroundings which remain cool and green throughout the year. 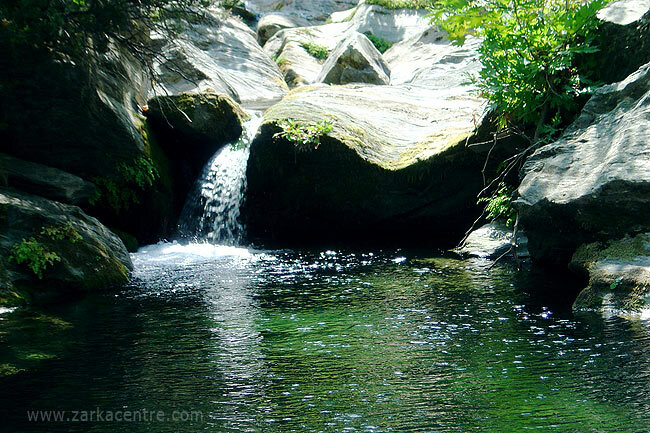 This area is renowned for its wildlife and in particular a wide variety of plants. An hour & 1/4 drive north from Zarka takes you to the island’s capital, Chalkida, which marks the mid point between southern and northern Evia. Only 45 minutes north of Zarka lies Eretria, well known for it’s archaeological sites and museum. Evia is fortunate among Greek islands in having a bridge connection to the mainland (as well as several ferry links) so that it remains accessible all year round. The bridge spans the Strait of Evripos at Chalkida, the strait being famous for the reversal in direction of its tidal flow every six hours. 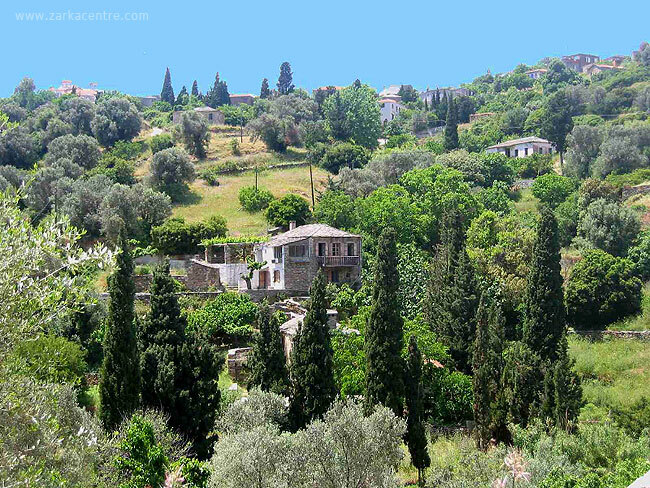 Northern Evia is generally greener than the south, with a little more tourism. It has many interesting towns and villages, good beaches, monasteries and museums. Highlights include the petrified forest and mammals at Agia Anna and the spa town of Loutra Aedipsou with it’s many hot springs, in which Hercules was said to have recovered his strength between feats!